Back in March this year, I was part of a very small audience at The Borderline to witness Hunter Hayes’ second show on UK soil, following a gig at the Drury Club in 2014 which unfortunately I could not attend. As an avid fan of Hunter since the very beginning of his career, this was a show I just had to see. As expected, Hunter provided us with a fantastic evening of entertainment, and he seemed completely bowled over by the reaction of the crowd, who sang along to every single word and gave Hunter the warm reception that he thoroughly deserved. I came away from that show totally bewildered as to why someone of Hunter’s incredible talent was limited to playing in front of an audience of just 300 people, even more so when you consider the potential in this country for his pop, mainstream-orientated style of country music. Little did I know that within the space of 6 months, Hunter would be embarking on two nationwide tours, selling out venues all around the UK. Which brings me to September 27th, 2015 at the Institute, Birmingham. A couple of months before, during his first tour, Hunter sold out the smaller room at this venue, The Library, and to me it seemed like a real challenge to return so soon and attempt to sell out a much bigger room. However, Hunter did exactly that, which provides a great reflection on the rate at which his music is growing and being heard by a much larger audience here in the UK. Appearances on UK TV shows such as Sunday Brunch and BBC Breakfast have really helped Hunter catapult himself into the mainstream market. Once again Hunter did not disappoint, and despite this being my third time seeing Hunter in a year, I saw a totally different show to before, packed with brand new arrangements, new spins on familiar hits and also a number of brand new tracks thrown into the mix. Hunter opened the show with one of the hits from his phenomenal ‘Storyline’ album, fan favourite ‘Tattoo’ which is also featured on his UK ‘I Want Crazy’ album. This pop-infused twist on country music is a wonderful way to open the show, as it showcases Hunter’s magnificent guitar-playing skills whilst also providing the audience with an opportunity to get involved during the anthemic, sing-a-long chorus. The show was packed full of audience participation, most memorably during ‘Everybody’s Got Somebody But Me’. At one point, the band stopped altogether, and Hunter sat at the front of the stage allowing the crowd to sing the chorus back to him, to which Hunter looked on in disbelief and exclaimed “You guys know EVERY word! You’re incredible”. A personal highlight during Hunter’s 90 minute set was hearing a brand new track named ‘Suitcase’, a track with a more simplistic, laid-back approach than familiar hits such as ‘Tattoo’ and ‘Storm Warning’. The lyrics “I don’t want it if I can’t pack it in a suitcase” reflect Hunter’s love of being on the road, and the melody is reminiscent of ‘Everybody’s Got Somebody But Me’, providing a contrast in Hunter’s material from the high-energy guitar solos featured in tracks such as ‘You Think You Know Somebody’ and even ‘Somebody’s Heartbreak’ during the live version of the track. Hunter also treated us to a performance of a personal favourite from his recent six-track ‘21’ EP, ‘Young and In Love’. Hunter used this recent release as an “experiment”, releasing individual tracks on a weekly basis through streaming service Spotify, a concept which I personally love, as it beats waiting for months and sometimes even years to hear new music from your favourite artists. Yet again, the crowd seemed to know every word despite ‘Young and In Love’ being a very recent release. It was a shame that we didn’t hear many other tracks from the ‘21’ project during the Birmingham Show, however Hunter performed ‘Where It All Began’ and ‘Someday Girl’ during other shows on the tour. It is interesting to compare the set lists for different shows on the tour, as it demonstrates Hunter’s willingness to put on a different show for the fans every single night. Throughout the show, Hunter reeled off a number of hits, including ‘Wanted’ and ‘Invisible’ which were performed back-to-back during a wonderful section of the show with Hunter on the piano. During ‘Invisible’ in particular, the passion in Hunter’s delivery of the song is clear to see – a track very dear to his heart which he explained “has touched so many people across the world and has had a bigger impact than I could ever have dreamt”. Hunter brought the show to an end with smash hit ‘I Want Crazy’ followed by a cover of One Republic’s ‘Counting Stars’, a cover which seems to have become a favourite for Hunter and a consistent feature in his shows. Watching ‘I Want Crazy’ being performed live really is an experience and it turns up the energy of the original track to a whole new level, with Hunter encouraging the audience to jump around in time with the punchy rhythm of the chorus. ‘Counting Stars’ then provides yet another fantastic opportunity for crowd participation due to the enormous success of the original track in the UK charts. 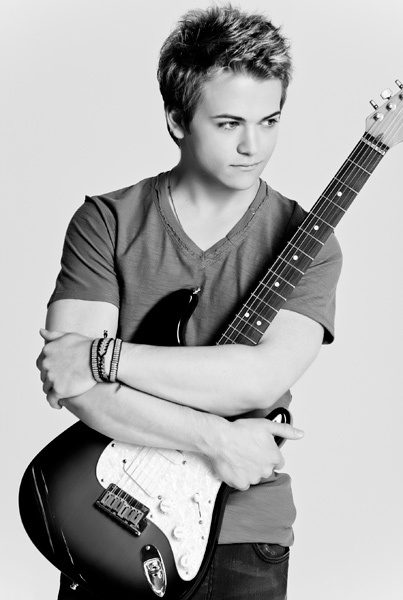 However, the most impressive aspect of seeing Hunter live is the time which he devotes to his fans. After the show, Hunter spent 20 minutes walking back-and-forth along the barrier, signing autographs and taking photos. I have seen him do this at each of the 3 shows I have been to, which is a wonderful thing to witness and something which is extremely rare at concerts nowadays. Afterwards, a small group of fans had gathered outside at the stage door, and Hunter stood and spoke to every single person, so appreciative of us giving up our time to wait for him. At times like this it is no mystery as to why Hunter has been able to build and maintain such a loyal fan base, as his love and appreciation of his fans is on another level to anything I have ever witnessed before. Let’s hope he continues to visit us in the UK, and I can’t wait to see how his popularity will grow and grow over here, which is inevitable for such a talented and humble individual.